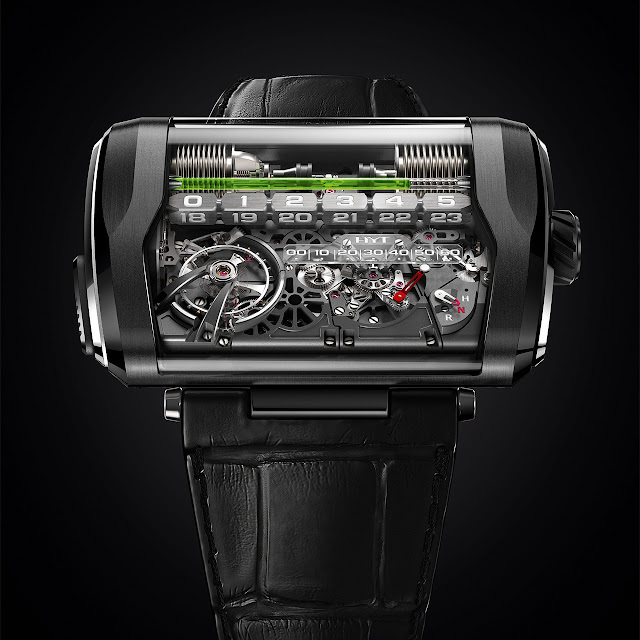 HYT deconstructs time with the H3 then reassembles it around its founding principle of two bellows that inject fluid into a capillary tube that advances with the hours. The H3's objective is to show hours on a linear display. This was the starting-point for a new movement, developed with Audemars Piguet Renaud & Papi, that ensures the smooth flow of the hours along this linear display. The result is a watch without hands and with no noon. HYT has imagined a rotating, four-sided dial, positioned alongside the hour tube. Each of these sides has six one-hour graduations for a total 24 hours. At the end of each six-hour period, the hour marker makes a retrograde movement during which the dial makes a controlled rotation. Minutes are also counted on a linear display by an articulated, retrograde double arm that sweeps a scale. 25-piece limited series.